El centre de negocis Gild International de Barcelona acull des de la setmana passada obres de Lluís Vilà i Rafael Marquina. Ambdós autors gestionats pel Lluís Vilà Showroom. El nou centre de negocis barceloní, dirigit per l’emprenadora gironina Laura Pelegrín, aposta per l’art i la cultura com un motor per potenciar les empreses i la creativitat. 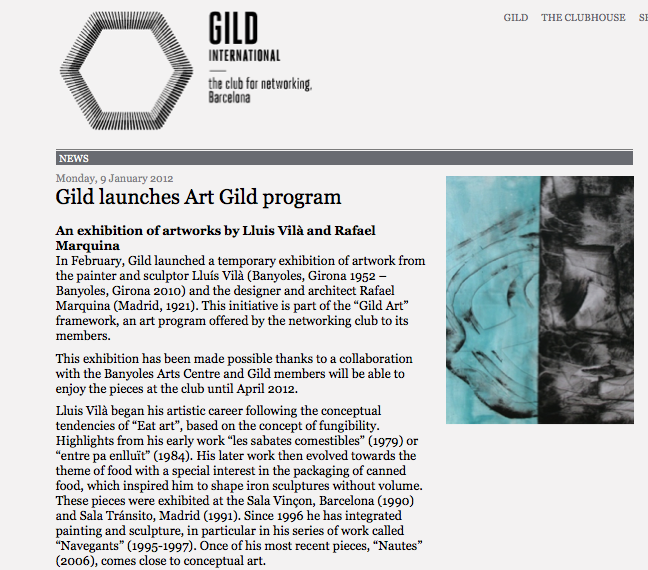 In February, Gild launched a temporary exhibition of artwork from the painter and sculptor Lluís Vilà (Banyoles, Girona 1952 – Banyoles, Girona 2010) and the designer and architect Rafael Marquina (Madrid, 1921). This initiative is part of the “Gild Art” framework, an art program offered by the networking club to its members. This exhibition has been made possible thanks to a collaboration with the Banyoles Arts Centre and Gild members will be able to enjoy the pieces at the club until April 2012. Lluis Vilà began his artistic career following the conceptual tendencies of “Eat art”, based on the concept of fungibility. Highlights from his early work “les sabates comestibles” (1979) or “entre pa enlluït” (1984). His later work then evolved towards the theme of food with a special interest in the packaging of canned food, which inspired him to shape iron sculptures without volume. These pieces were exhibited at the Sala Vinçon, Barcelona (1990) and Sala Tránsito, Madrid (1991). Since 1996 he has integrated painting and sculpture, in particular in his series of work called “Navegants” (1995-1997). 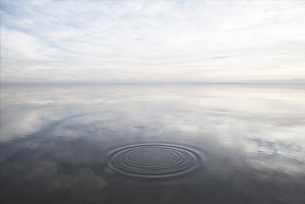 Once of his most recent pieces, “Nautes” (2006), comes close to conceptual art. Rafael Marquina is a well known industrial designer, in particular for his anti-drop oil and vinegar design sets. He worked in self-propulsion design at Tallers Costa (1957-1958), remodelling the Jowllery J.M Sert (1969). He also designed the round table at Barcelona´92 and the standard lamps at Iluminil S.A. (2004). At Gild International some of his sculptures will be on display, an artistic side to him less known but no less valuable.